When foodstuff are getting to the end of life, I make an everything but the kitchen sink fried rice. For example, I had 2 day old Chinese takeout rice (perfect for fried rice) and a bag of baby spinach that I needed to use. I almost always have Chinese sausage from Costco in my pantry and had these little Korean sausages in the freezer. Throw everything in a pan and give a whirl. Recipe is below but be creative with it. Throw in leftover chicken or steak. I’ve used baby bok choy and peas. Use brown rice and firm tofu. The possibilities are endless. I usually don’t use measuring tools so the amounts below are estimates. Throw in a little at a time until you get the desired taste. Also, I tend to make my fried rice Thai-style with fish sauce, so if you don’t like that then omit it. Lastly, I try to avoid adding salt to my dishes but you will get sodium from the soy sauce and/or fish sauce. Make sure you have all the ingredients prepped. It will cook fast. 1. Spray the wok or large pan with canola oil and turn the burner on to medium-high heat. 2. 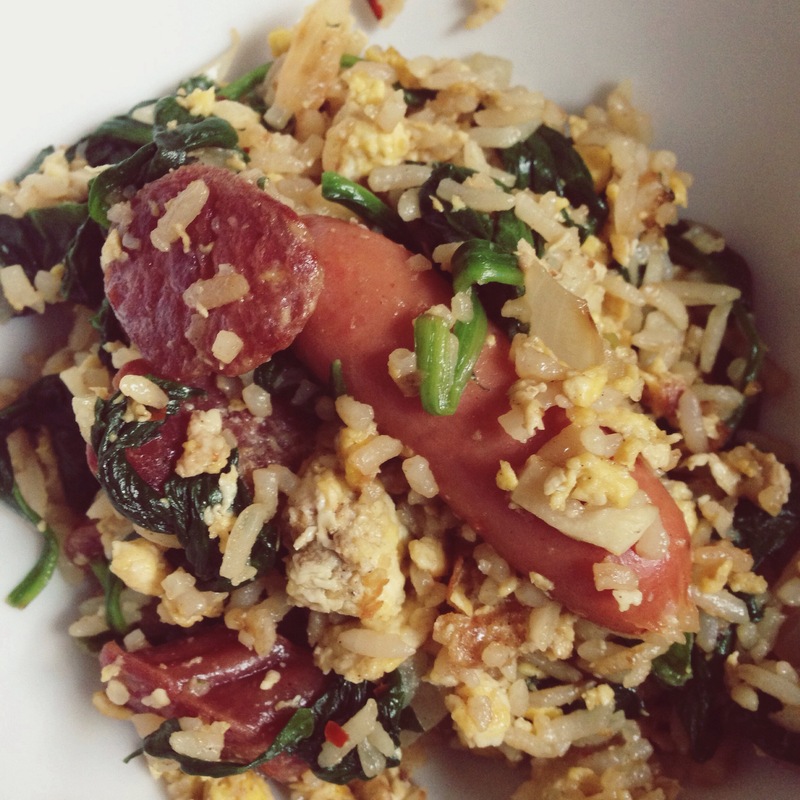 Add the Chinese sausage when the pan is hot. The sausages will start to release some oil. 3. Throw in the onions and garlic. 4. Cook for a minute and then throw in the eggs. I just break them into the pan but you can scramble them beforehand. Cook the eggs like you’re cooking scrambled eggs. 5. Throw in the rice and spinach. Break the rice up and start mixing everything together. 6. Add the soy sauce and fish sauce. All the while still stirring. 7. Add the chilies, crushed dry chilies and white pepper. 8. Make sure you’ve cooked everything through and it’s pretty evenly distributed. Then serve. Spinach cooks really quickly so if you’re using a more substantial vegetable then you want to either throw it in with the onions or right after. For example, it’s if celery, carrots or Chinese broccoli, I would throw it in with the onions. If it’s bok choy then I would throw in before the egg and cook for a minute. This is a really good recipe to experiment with, so give it a go!